Passages used as “law” help show us our sin and need for a Savior. 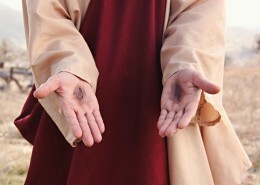 Passages that are “gospel” tell us of God’s love and of what our Savior did to save us. We preach God’s law so that we can point people to the gospel. One of the reasons God has given us his Word is to make us feel sad. Yes, you read that correctly—God wants us to feel sad. 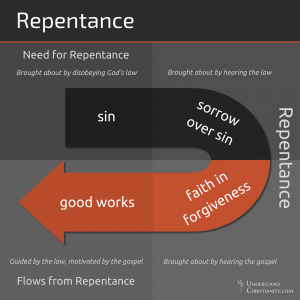 “Godly sorrow brings repentance that leads to salvation and leaves no regret” (2 Corinthians 7:10). He wants us to feel sad because it is the only way for us to feel the true happiness in his forgiveness, and that is what he ultimately wants us to feel. In order to feel these things and to fully appreciate God’s Word, a Christian should have a basic understanding of law and gospel. God tells us in his Word, “Be holy because I, the LORD your God, am holy” (Leviticus 19:2; “LORD” in all capital letters refers to God’s name for himself—see Church Lingo for more information). 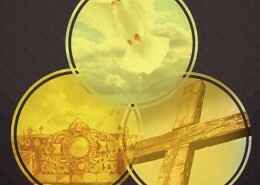 How do we know what God considers “holy” and what he considers unholy? That is what we call God’s law. His law refers to the moral standards he has set for human beings and their life on this earth, and he has written his law on every person’s heart from the moment they come into this world. However, since the moment Adam and Eve brought sin into the world, all people are born with sinful natures and cannot keep God’s law—we cannot be holy (see Sin and Repentance). But the sadness this causes us to feel is the very sadness God wants us to feel, because that is where the gospel comes in. After Adam and Eve brought sin into the world, God promised them and all people afterward a Savior from sin. That promise is called the gospel, a word that literally means “good news.” The gospel message was passed down from Adam and Eve from generation to generation and was preserved through a nation known as Israel, and later through a group of people who became known as Christians (see The Bible is the Word of God). Thus, the message of Christianity is summed up in the gospel message: the message of forgiveness through Christ’s fulfilling God’s law for us and his perfect sacrifice for our sin (see Forgiveness of Sins for All People). 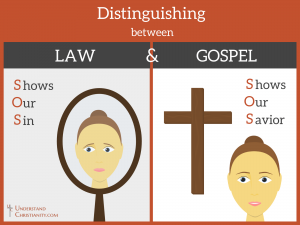 A basic understanding of law and gospel is important for anyone trying to understand the Scriptures because it guides our interpretation of what God is telling us with particular passages. It also helps us see how we should use those particular passages when teaching and learning with others. With many passages in the Bible God is either trying to remind us that we’ve messed up and are sinful (making us feel godly sorrow over our sin), or he’s trying to remind us that we’ve been forgiven through Jesus (making us feel joy and appreciation for God). Sometimes a passage could be taken as either law or gospel, depending on the condition of the person’s heart who’s hearing it, whether they need to hear the law or hear the gospel. For example, there are two different ways a person could look at this passage from Proverbs 5:21: “For your ways are in full view of the LORD, and he examines all your paths.” A person could read that and become afraid that God sees all of the sinful things he or she does. That passage would then be acting as “law” for them. Or a person could read that passage and it could have the exact opposite effect. If a person was afraid and felt alone and helpless they could understand that passage as God always being present and watching over them. That passage would then be acting as “gospel” for them, reminding them of God’s love and care. We, as Christians, are to use God’s law to remind us of our sins and to show others their sin in a loving way. If a person is sinning and doesn’t know it, or if they’re willfully sinning against God, then we use God’s law to show them how they are sinning against God. This does not mean we are viewing ourselves as better than them in any way. We should never think that we are holier than the person we are proclaiming God’s law to because we are sinful just as they are (Romans 3:23). We should not judge each other, that is, look down upon others, but instead help each other see our sins so we can be mutually built up and grow in the faith (Matthew 7:1-5). The purpose of showing someone their sin is ALWAYS meant to guide them toward repentance. This is what Christians call “preaching the law” to someone. If someone is feeling guilty over their sin, then there is no need to preach, or continue to preach, the law to them about that particular sin. 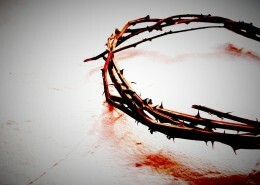 They have already acknowledged their sin and feel that godly sorrow (this is called contrition). If someone is feeling sorrow over their sin then we should instead preach the gospel to them, that is, proclaim to them that their Savior lived a perfect life for them and died for their sin. This is always the ultimate goal of using the law—we want to get to that point where we can remind and assure ourselves and others of God’s forgiveness. This is why we must be careful to use the law and the gospel in the appropriate situations. Preaching the law to someone who needs to hear the gospel can drive them further into despair and away from the comforting message of what Jesus did for them. Preaching the gospel to someone who needs to hear the law can cause someone to become more comfortable in their sin and forsake what Jesus did for them. Knowing exactly when to use law and when to use gospel with someone can be a very difficult skill to learn, but through prayer and God’s guidance we can become more confident in serving our fellow brothers and sisters in this way, as God desires for all of us (2 Timothy 3:14-17). 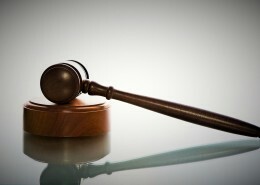 We must also be careful to keep the law and the gospel separate in our preaching and teaching. Bringing the law into the gospel turns the focus away from the work of Christ for our salvation and instead to our own works, which can never earn us salvation (see Justified by Grace through Faith). For example, telling someone they need to earn God’s forgiveness in some way takes away from the beauty and comfort of the gospel. On the other hand, bringing the gospel into the law takes away from the force of the law to guide someone to repentance, preventing them from turning away from their sin and/or seeing their need for a Savior. For example, if someone is sinning and doesn’t care, then telling them their sin is forgiven will only lead them to continue in their sin without regard for what God thinks is good. 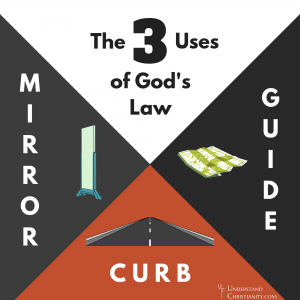 While using law and gospel can be a difficult task, a basic understanding of the two kinds of teachings can go a long way in someone’s understanding of Scripture. For someone who is sinning, hearing the law leads them to see their need for a Savior and guides them in holy living for God. 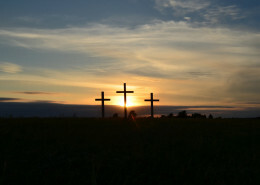 For someone who is feeling sorrow over their sin, hearing the message of forgiveness through Christ grants faith and strengthens them in their love for God. 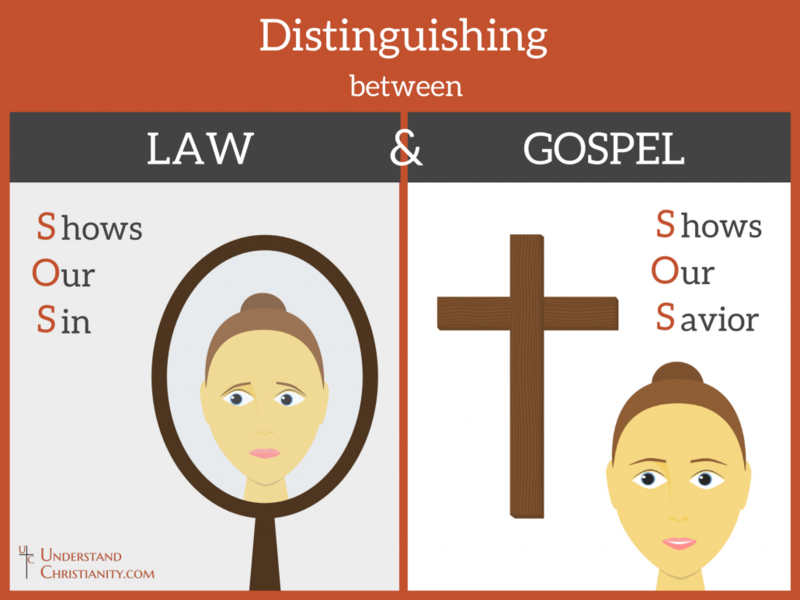 While law and gospel are two messages that need to be kept separate from each other, one can certainly see how they are a match made in heaven. Since much of the Bible can be applied as either law or gospel, the passages referenced here are meant to give you an understanding of the teaching itself and a few examples of it being used in Scripture. Have a question about this teaching?